2016 Champagne Tasting - Cooking With C.C. The champagnes that we tasted were “Grower Champagne.” What this means is that the wine is produced by the same estate that grew the grapes. Most of the mass market champagne is made by large champagne “houses” like Veuve Clicquot, Mumm, Piper-Heidsiek and Moet & Chandon. The large houses source their grapes from throughout the Champagne region to make the volume of wine that they produce. The Grower Champagne is considered more “artisanal” and represent the “terroir” throughout the area. As you can see, that’s quite a line up and I enjoy these tastings because I can’t afford to buy a bottle of all of these just to try them. The other great thing is that I know which ones I like and which ones I don’t. I would hate to spend that much on a bottle of bubbly that I don’t like. For this particular tasting, I took notice of the grapes used in the blend. What I learned was that my preference is towards those wines that rely less on the Chardonnay grape. Since I’m talking about what I like – several of these are great champagnes, just not for me. I was speaking with one of the knowledgeable folks and their favorite was the one I liked the least. My two favorites out of this grouping were the Billiot and the Gaston Chiquet. The Billiot is 75% Pinot Noir/25% Chardonnay, the Gaston is 40% Pinot Meunier/35% Chardonnay/25% Pinot Noir. My least favorites were those with mostly chardonnay. For example, the Jean Milan and Pascal Doquet are both 100% Chardonnay. My least favorite of the evening also happened to be the most expensive – the Vilmar & Cie Grad Cellier. This one is 70% Chardonnay/20% Pinot Noir. Like I said, this was the favorite of some of the other folks. To each his own. Once again, grape varietal won us over. Our favorite from this group was the Josef Leitz which is 100% Pinot Noir. Our second favorite was the Louis de Grenelle which is a blend of Chenin Blanc, Chardonnay and Cabernet Franc (I couldn’t find exact blend percentages). Surprisingly, I normally enjoy Prosecco and Cava, however, these two just did not float my boat. (Prosecco is from the northeast region of Italy generally above Venice, Cava is from the northeast region of Spain around Barcelona). While we didn’t taste any sparkling wine from California, there are also many very nice wines that I enjoy. Like the other non-champagne many are less than $20 a bottle, so experimenting is not a huge financial commitment. 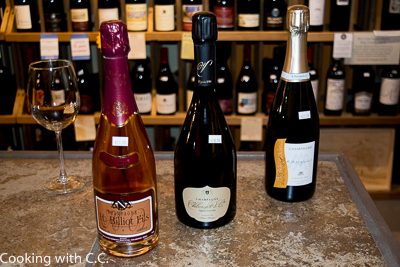 I can find many sparkling wines that I enjoy at various price points. The key is having the opportunity to try a variety of wines. This is why I highly recommend attending the various wine tastings around town. Gives the opportunity to try many different wines for a small investment (This tasting was $15 per person – inexpensive to taste 12 wines) so you know that when you buy something to enjoy, you will certainly enjoy it!